Managing, preserving, and sharing research data. The HS/HSL's research services are designed to advance the success of UMB faculty, staff, and students and encompass each step of the research process. Consult with a member of our data management team for assistance with developing a data management plan, or in locating, describing, storing, or sharing data. 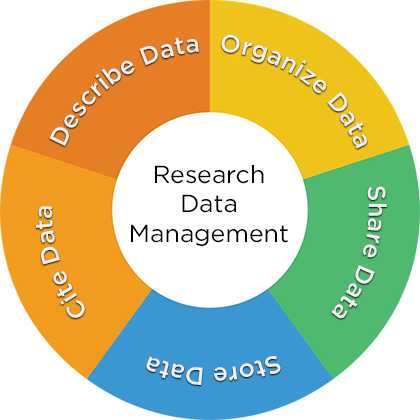 Following best practices in research data management can help you, your lab, or center secure grant funding and create data output that becomes part of the scholarly record. The FAIR Data Principles provide a guideline for facilitating Findability, Accessibility, Interoperability, and Re-usability. Given the importance of managing data, many funding agencies are requiring that plans for managing data be submitted with grant applications. An effective plan to collect, share, reproduce and preserve data may increase the impact of your research. Read about HS/HSL’s workshops, including Data Management 101 and Creating a Data Management Plan with the DMP Tool.